For college students passionate about improving the health of children and youth, consider an internship at Project GROWS! 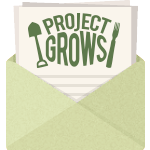 Internships at Project GROWS offer college students hands-on opportunities to dive deeper into all the areas of our mission – food education, food access, and food production. Farm to School Interns focus on garden-based nutrition education and improving food access while Farm Interns devote their time to production from seed to harvest. Through the experiential nature of a Project GROWS internship, students gain practical skills while becoming confident leaders in the community. For more information contact our Education Manager, Nichole. There are no jobs available at this time – please check back!